We have booked a couple of nights at Grotta Giusti, an elegant hotel located a short taxi ride from the pretty town of Lucca, and a second stay at its sister spa hotel Bagni di Pisa, less than an hour away. Our group, like many modern spa goers are looking for results, a sense of rebalance and new methods to kick-start healthy lifestyles. 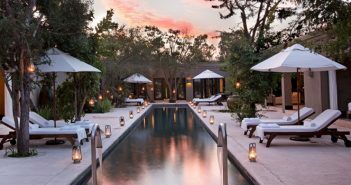 And if Hollywood celebrities and Italian glitterati are to be believed, these two hotels are the places to do it. Giusti offers skin and respiratory treatments, thermal mud wraps and its thermal spring supplies its range of outdoor pools ­with water rich in bicarbonate, sulphate, calcium and magnesium. Even the bath water in your bedroom comes straight from the underground spring. 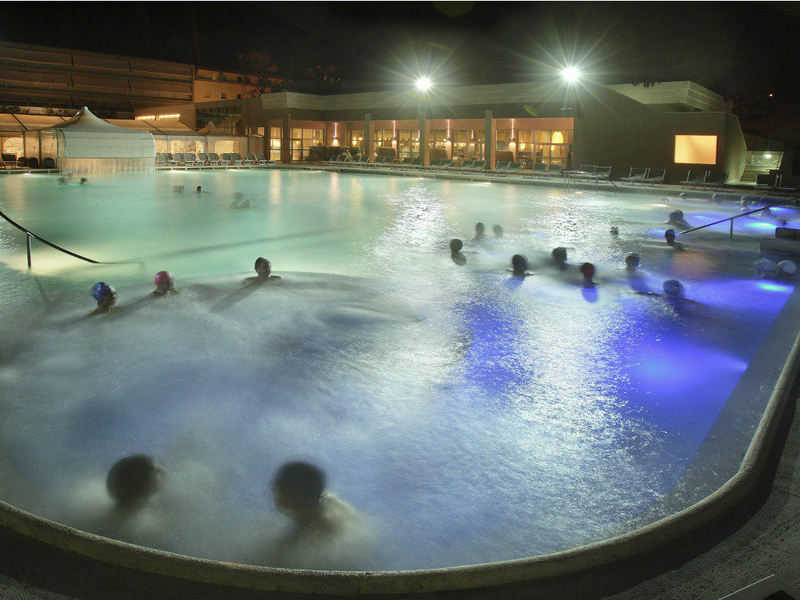 The huge outdoor thermal pool is one of Giusti’s top attractions and has over 35 different hydro massage jets. Backed by towering, verdant hills, the outdoor thermal pool area feels like an alpine retreat and proves our favourite place for a pre or post treatment snooze. The Grotta Giusti thermal lake is a glittering slice of emerald water deep within the grotto cave, which plummets deep (so deep, in fact, that guests can scuba dive in its tunnels) below the hotel’s walls. The Watsu treatment is one of Grotta Giusti’s newest additions to its extensive spa menu and while many guests are happy to just relax in the semi-sauna-like conditions of the grotto on the lounge beds, Watsu is the only treatment that takes place in the pool itself. The Watsu begins with deep, almost yogic, breathing in the amber-lit caves. This calms and centres guests and also begins to connect the practitioner with the client. We descend into the body-temperature water, traversing the grotto, holding on to the walls – its narrow so you don’t swim. At the wider end of the pool, the Watsu begins. With one hand on my back, I’m lightly cradled and moved along the water’s surface slowly by Paolo. The treatment is all about flow and once you relax into it, the feeling of weightlessness and movement along the water is serene and calming. Some have drawn comparisons to the experience of being in the womb, and though I’m not quite on the plain, the balletic movements and gentle stretching is incredibly relaxing. The combination of water therapy and gentle stretches did impart a quiet zen-like feeling and in terms of unique spa experiences it’s certainly in my top five. The hotel is well known for its work in the treatment of asthma and respiratory problems and skin complaints, but the spa menu also offers pampering treatments that use thermal waters and thermal mud to restore skin and give an extra sparkle. We opted for the Detox Body Treatment (60 minutes, E75) – where after an initial exfoliation your body is enveloped in warm clay; thick, gloopy and luxuriant, my skin felt incredibly smooth afterwards and the glow lasted for days. Grotta Giusti lives and breathes spa – guests sashay around the hotel with their swim caps on and gowns and slippers are welcomed even in the restaurant at lunch making for a friendly and relaxed ambience. The range of vegan and vegetarian offerings are really impressive. Of course, being Italy, there are stunning Tuscan dishes available everyday as well, ranging from wild boar and cavello nero to mouth-watering pasta and delicate antipasti but if you’re on a clean eating mission, this spa can deliver you delectable dishes rather than dreary dinners. For those looking for medi spa treatments, there are a huge range on offer and for guests seeking weight loss or rebalance, the Equilibrium programme runs at both hotels and is designed to kick-start a healthy living lifestyle. The seven-day programme, available at both spas, includes medical check-ups, dietology, coaching, fitness, thermal therapeutic treatments and the dietary side of things are honed in cooking classes and menus designed specifically for the guests of the Equilibrium programme. Sadly, it does mean going without the sommelier’s rich velvety Chianti Classico Reservas. 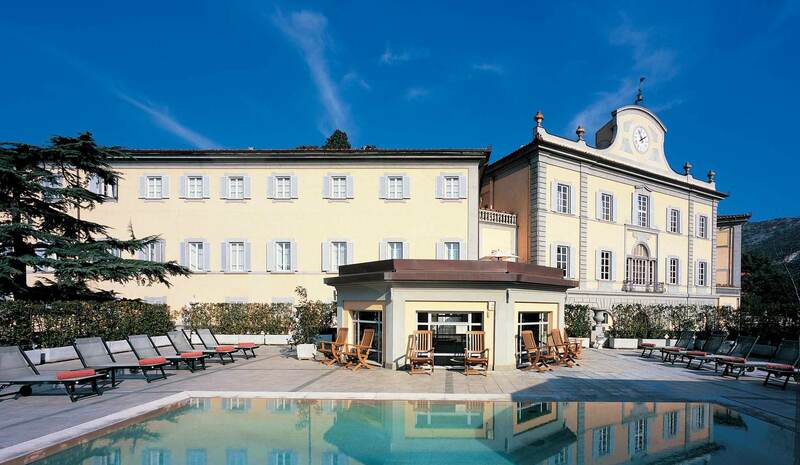 Second but by no means least on our Tuscan spa tour was Bagni di Pisa, an elegant sister hotels to Giusit, it was built as a summer residence for the Grand Duke of Tuscany and is a place for serious pampering. The frescoed walls, palatial suites, gargantuan bedrooms and suntrap-tiered garden have welcomed Byron, Shelley and King George IV, not to mention a plethora of modern royal families from around the world, and the grand building is a perfect retreat for lux getaways and romantic escapes. There is champagne on arrival and it even smells divine, thanks to the huge Dr Vranjes diffuser bell jars dotted around the spa and hotel. Bagni di Pisa’s underground spring feeds the hotel’s array of pools and hydrojet water therapy pools and the spa offers myriad facial and massage therapies along with mud and inhalation treatments. Not to be outdone, Bagni di Pisa has it’s own thermal cave as well. Smaller and more intimate, a candle-lit walkway leads to the Hamam dei Granduch. This romantic thermal cave has a small plunge pool and can be booked for two or four guests at a time. It’s perfect for couples and utterly blissful. The spa itself feels like a sumptuous Roman baths with colour washed walls, inviting pools filled with mineral waters, thermal baths, steam and sauna rooms and relaxation lounges complete with rugs and cloud-soft towels. The Indoor Ponente Thermal Pool has a beautiful watercolour-blue vaulted ceiling and its natural temperature water of 38° C soothes away stresses, the Bioaquam Circuit features sculpting hydro-massages for toning and drainage, and the rooftop thermal pool boasts magical views from the outdoor pool. Though a stunning summer retreat, I loved swimming in the steaming thermal rooftop waters with crisp air all around and using the outdoor sauna. The treatments were truly luxurious and the therapists excellent across the board. My antioxidant facial included three lux masks, cleansing, steaming, a sleep-inducing facial massage and I could see instant visible results. 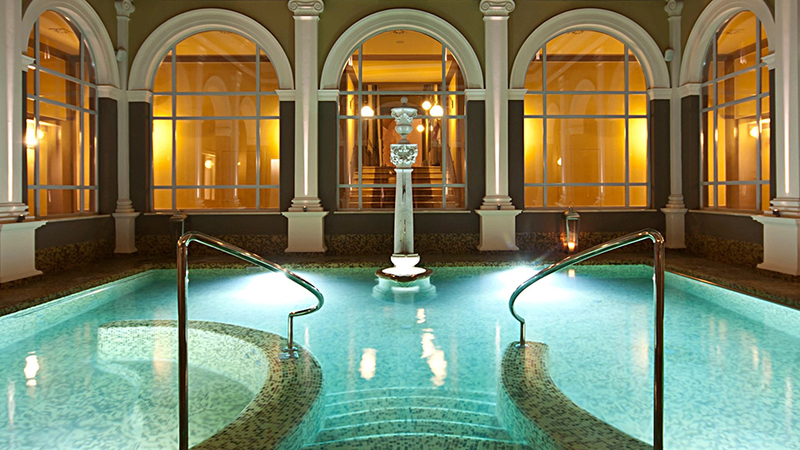 Both Grotta Giusti and Bagni di Pisa offer two sides of the spa coin – great spots to indulge in some well needed R&R, but with results focussed therapies on offer as well, those in search of medi spa facilities will not be disappointed. The plethora of pools and jets and saunas and grottos are the real showstopper and make Tuscany a very attractive spa offering. Nightly rates at Bagni di Pisa start from €208 per room per night in a Comfort Room on a B&B basis. Rates also include wi-fi, access to spa, thermal pools and fitness facilities. Deluxe room park view €345 per night/per room HB treatment. Nightly rates at Grotta Giusti start from €200 per night in a comfort room on weekdays on a B&B basis. Rates also include wi-fi, access to spa and fitness facilities. Suite €547 per night/per room in HB treatment.